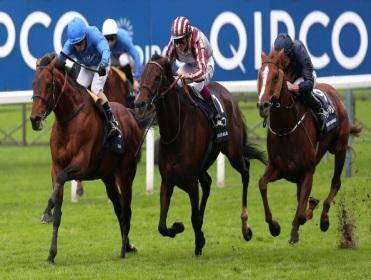 Farhh leads home Cirrus des Aigles and Ruler Of The World. "Farhh deserves plenty of credit, but Silvestre de Sousa does too, for having his horse best placed of the principals before striking for home..."
British Champions Day 2013 largely managed to answer its critics, with high-class and competitive racing, albeit in front of a diminished paying crowd and on ground that looked to be tending towards soft on the straight course and heavy on the round. There are few sayings more trite in racing than "a good horse will go on any ground", but that good horses should sometimes be asked to prove their effectiveness on surfaces not entirely to their connections' choosing seems self-evident. The ground provided ready (if not necessarily valid) excuses for some of the beaten horses and had a clear effect on both overall and sectional times. Fortunately, we know what the sectionals were in this instance, courtesy of TurfTrax's electronic ones for all horses at furlong intervals. Unlike on some occasions in the past, the provision of sectionals seemed to go smoothly and the resulting figures appear accurate. They tell us plenty about what went on that will not have been apparent to the naked eye. The Long Distance Cup resulted in a finish which was slightly quicker than could be expected given the overall time, with the winner Royal Diamond coming home in a speed 103.9% of his average race speed (last 3f) and 102.0% (last 2f), when par is slightly above and slightly below 100% respectively. Mark-ups are small but it is worth noting that sixth-placed Biographer ran the last 2f fastest of all (26.61s) and may remain with potential. 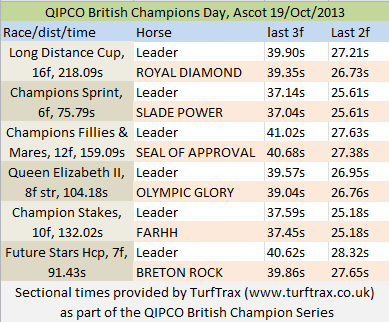 Slade Power in the Champions Sprint was another winner to finish slightly quicker than par from 3f out (102.3% of average race speed), but he was actually slightly slower than par for the last 2f (98.6%). Runner-up Jack Dexter ran the last 3f 0.20s quicker and the last 2f 0.13s quicker, which is strictly enough to account for the margin of a neck by which he was beaten. Jack Dexter's 11.36s from 3f out to 2f out was the fastest by-furlong sectional on the card. The Champions Fillies & Mares race proved to be about stamina, not speed. Seal of Approval's last-3f time is equivalent to a finishing speed of 97.8% and her last-2f equates to 96.8%. This is not hugely slower than par, with the 12f track at Ascot influenced by a notably fast opening section, but it is slower. As much to the point, Seal of Approval's rivals finished slower still. She came from mid-field as others flagged and was probably flattered by her margin of superiority if not by her win. Similar comments apply to Olympic Glory's win in the Queen Elizabeth II Stakes, for he ran closest to par by some way but won emphatically enough to think that he was best in the race in any case. Sectional pars for the straight mile at Ascot imply that the ideal ride for a horse achieving his overall time would have such a horse around 1 second off the pace that was being set by outsider Burwaaz mid-race; TurfTrax sectionals had Olympic Glory 1.28s back after 3f and 1.10s back after 4f, before he swept through to lead approaching the final 1f. Take a bow, Richard Hughes, while sectionals imply the horses closest behind Olympic Glory might have been a couple of lengths closer ridden more efficiently. But the real sectional story of 2013 British Champions Day concerns the Champion Stakes itself. It might not have been obvious visually, but the sectionals show that the principals came back quickly. Farhh's last-3f speed was 105.8% of his average race speed and his last-2f speed was 104.9% (compared to pars of just over and just under 100%). Due to the exponential nature of velocity-driven adjustments, a few lengths is neither here nor there when a race is truly-run but can make all the difference when the horses are running significantly faster or slower than par. That was the case in this year's Champion Stakes, and Cirrus des Aigles and Ruler of The World were up against it trying to overhaul a top-class rival who was quickening off a steady pace. Cirrus des Aigles ran the last 3f 0.21s quicker than Farhh, the last 2f 0.28s quicker and the last 1f 0.11s quicker, all the while in the context of a fast finish. It arguably made the difference between failure and success, while Ruler of The World's finishing effort was nearly as impressive (his penultimate 1f of 12.19s was the fastest by any horse on the day). Farhh deserves plenty of credit, but Silvestre de Sousa does too, for having his horse best placed of the principals before striking for home. Farhh has been retired, but Cirrus des Aigles and Ruler of The World should be back next year. The signs are that they can improve a bit on what they achieved in this race given the chance. Have you checked out our new, improved Facebook page? It's the place to go for our features & tips!